Woohoo! I’m so lucky to have Jennifer from Edible Sound Bites here again on Running on Real Food! Jennifer last stopped by with these incredible No-Bake Vegan Pumpkin Pie Tarts and she’s done it again with some awesome No-Bake Trail Mix Vegan Granola Bars. I can’t thank her enough for contributing these wonderful recipes to Running on Real Food, not to mention the stunning photography that goes along with them. She’s my photography hero and I only hope I can take photos as beautiful as hers one day, I mean, just look at them! So gorgeous. I really love the ingredient list in these easy, no-bake granola bars. 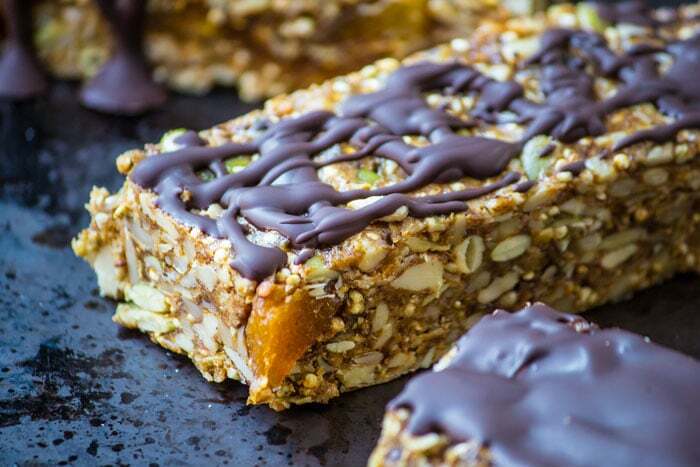 They’re packed with all sorts of delicious, healthy ingredients making them a great alternative to store-bought bars. 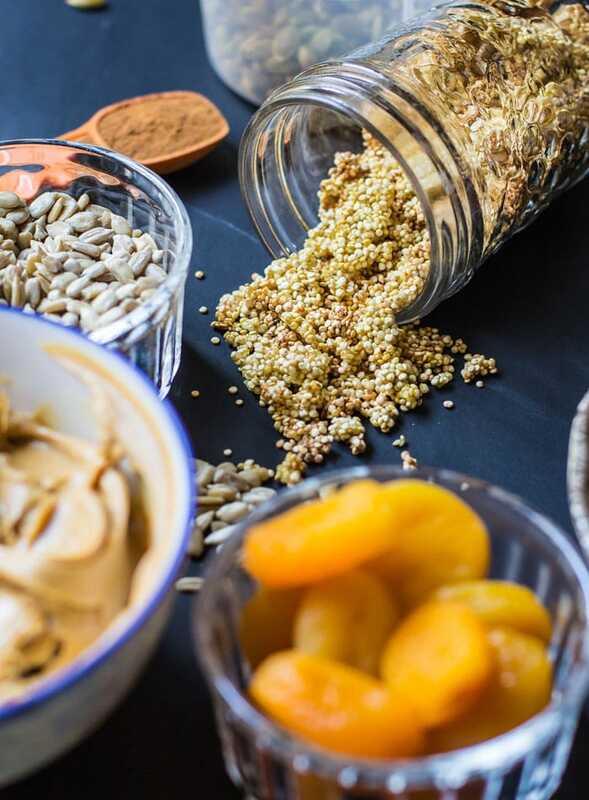 Toasted quinoa is an amazing addition and provides some nice, whole-grain energy while still keeping the bars gluten-free. I do a lot of hiking and exploring in the summer and these bars look just about perfect for my next adventure! Thanks for being here, Jenn! We love ya! Hey everyone! Jennifer here from Edible Sound Bites, where I love sharing about all sorts of healthy, (mostly) vegan + gluten free, easy, and delicious recipes. I’m really happy to be here on Deryn’s blog today, Running On Real Food! We’ve been blogger friends for some time now, and I must say that I am loyal follower of her site. It’s one of my favourites! I just love the simple healthy recipes she shares. She is so inspiring and down to earth and I’m happy to call her my friend. This is my second time guest posting here on RORF, and I couldn’t be more excited. So without further delay, let’s get started with the food. 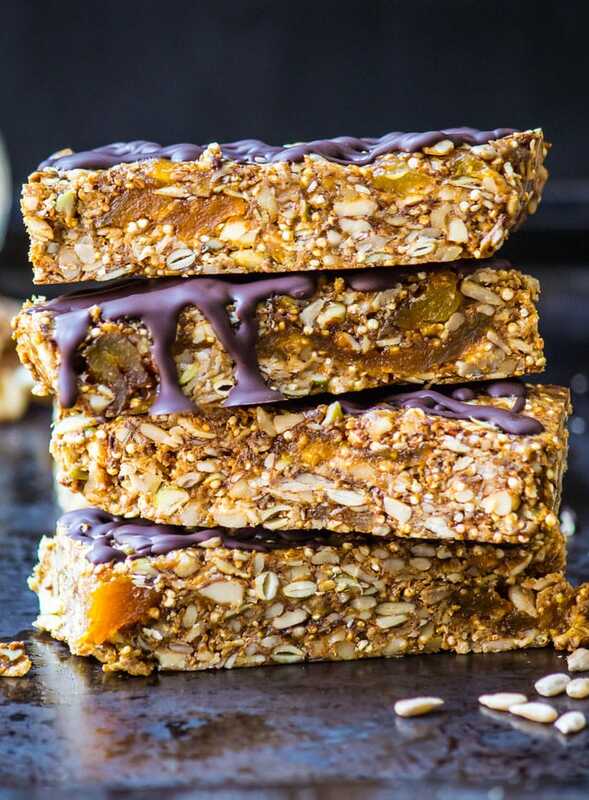 Today I thought it would be fun to share a no-bake granola bar recipe that’s simple and easy to make. You know the oh-so popular fruit and nut bars that you buy at the grocery store that are usually oh-so not healthy for you even though they’re advertised as healthy? Yeah. Sorry to say. But have no fear! 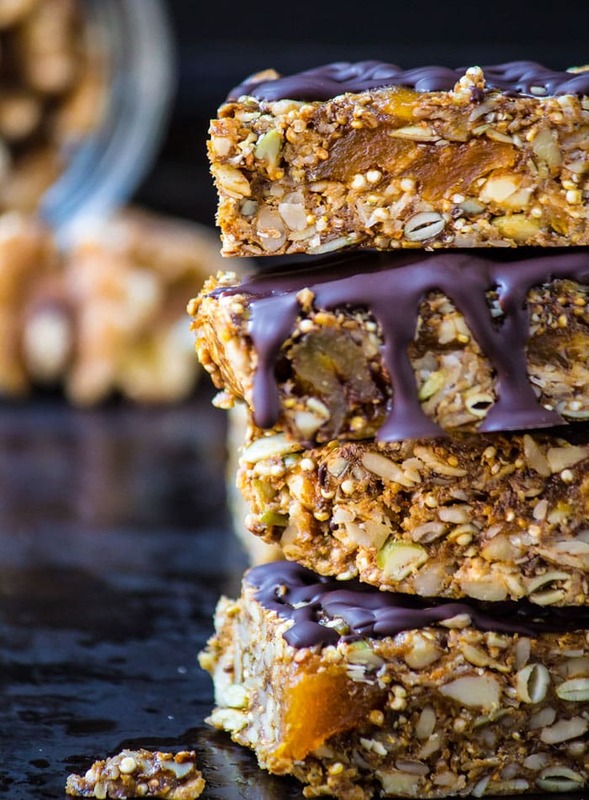 These granola bars taste just as good if not better than the store-bought ones, and you know you’re only eating the good stuff because you’ll know what’s in them. And, you can totally customize them with whatever dried fruits, nuts, and seeds you love. 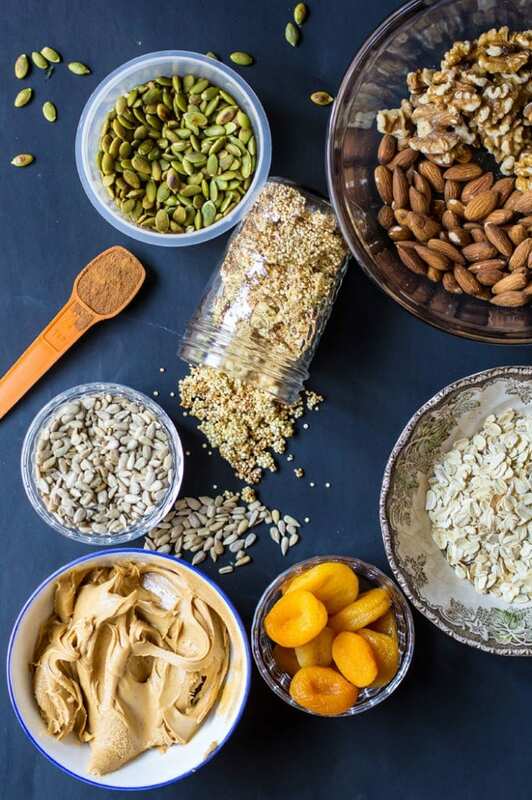 I happen to be a fan of dried apricots, walnuts, almonds, sunflower and pumpkin seeds. But you could easily use pecans, Brazil nuts, hemp seeds, raisins and cranberries or whatever you love the most. Next we have natural peanut butter (or your favourite nut butter), maple syrup, and calcium rich molasses. These help bring everything together. 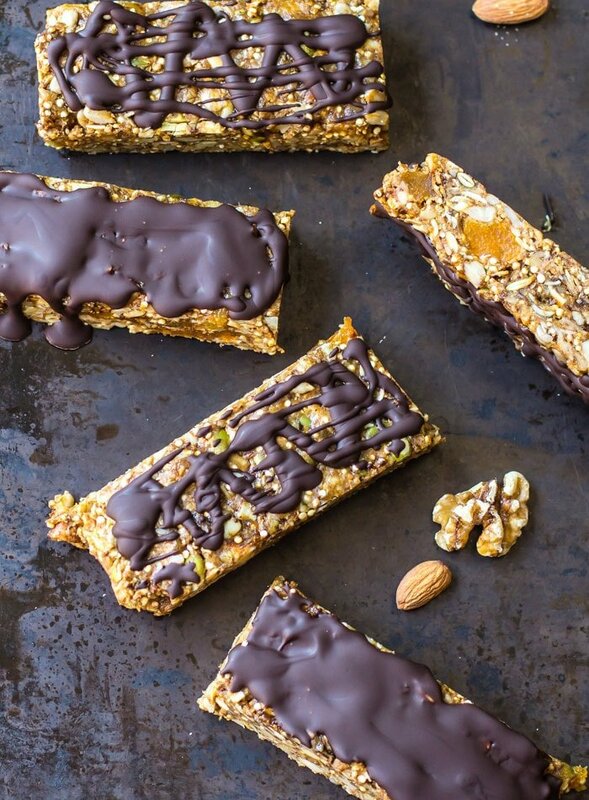 These bars pack a mean crunch thanks to the addition of toasted quinoa! They’re a super simple and healthy go-to snack. 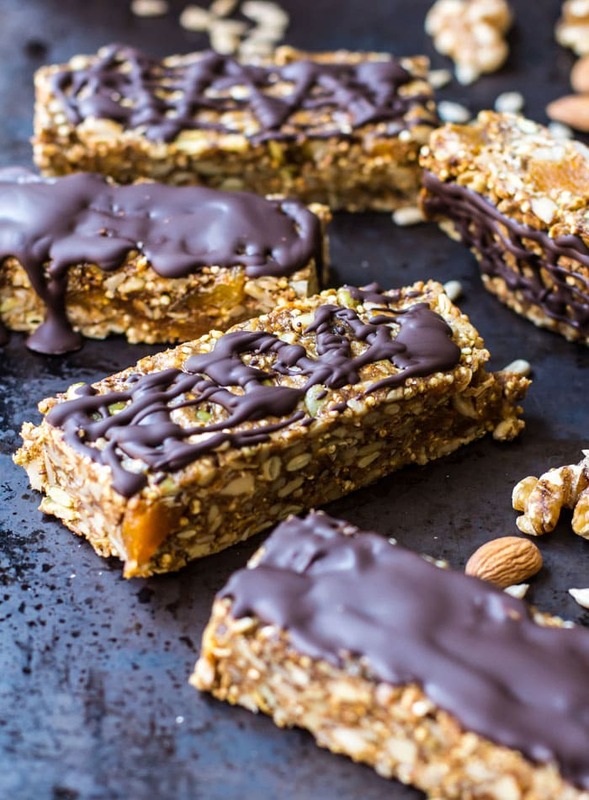 It takes about 10 minutes to mix everything together and although it’s not required…just highly recommended…the dark chocolate topping is the perfect little addition that makes theses granola bars out-of-this-world. Plus, they’re chock-full of protein, fiber, and healthy fats. Thanks so much for having me here today, Deryn! I hope you all enjoy these tasty granola bars! Toast your quinoa in a 350˚F degree oven for 10-15 minutes or until slightly golden brown. Remove from oven and set aside. In a food processor, add walnuts and almonds, and pulse on low until they are roughly chopped. Add rolled oats and pumpkin seeds and pulse just until the oats and seeds are broken up. Transfer the mixture into a large bowl and add the toasted quinoa and remaining ingredients (from sunflower seeds to sea salt). Stir until well combined. Once thoroughly mixed, transfer to an 8×8 inch dish lined with parchment paper so they lift out easily when ready to cut. Press the mixture down firmly into the pan, spreading out evenly to the edges. Refrigerate for at least 2 hours before slicing into 10 bars. Melt the dark chocolate in a small heatproof bowl set over a pot of water on low heat, or in the microwave. Dip the top of each bar into the melted chocolate and place on a parchment lined cookie sheet. Freeze 15-20 minutes for the chocolate to harden. Store bars in the fridge in an airtight container. 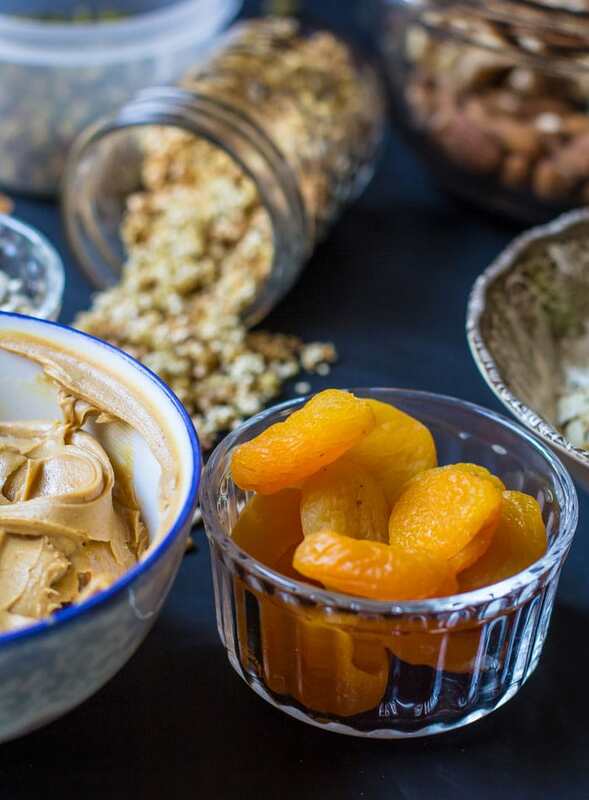 Feel free to mix and match dried fruits, nuts and seeds to your liking. The toasted quinoa is such an awesome addition! How many calories per bar would this recipe amount to? Hi Curtis, I believe Jenn answered over on Facebook that it’s about 300 calories and 12 grams of protein per bar! Thanks! This is on the list for the week. I love the nuts in the recipe and look forward to experimenting with different kinds. I enjoy being outside and these will be a great addition! Those look delicious. A bit of everything for sure! Those will be nice right out of the freezer, and great to have while out on the trails! Looks so yummy and great that they are no bake, especially when the last thing I want to do on a hot summer day, is turn on my oven and heat up the house! And vegan! Can’t wait to try these!